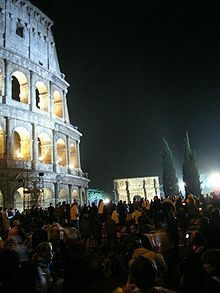 The Way of the Cross, celebrated at the Colosseum in Rome on Good Friday. The Scriptural Way of the Cross or Scriptural Stations of the Cross is a version of the traditional Stations of the Cross inaugurated as a Roman Catholic devotion by Pope John Paul II on Good Friday 1991. Thereafter John Paul II performed the scriptural version many times at the Colosseum in Rome on Good Fridays during his reign. The scriptural version was not intended to invalidate the traditional version, rather it was meant to add nuance to an understanding of the Passion. Before each station: Minister: We adore you, O Christ, and we praise you'. All: Because by your holy cross you have redeemed the world. Another version of the same exists and is currently in application in various churches and parishes, particularly in the Philippines. It starts with The Last Supper and ends with The Resurrection of Jesus. Version 1.2 or any later version published by the Free Software Foundation. This publisher thanks the contributor. Article text from wikipedia.org. Text is available under the Creative Commons Attribution-ShareAlike License. This publisher thanks the contributors of the text.